Search Results for "bowling game"
Bowling Ball out of Ball Return. Bowling game. 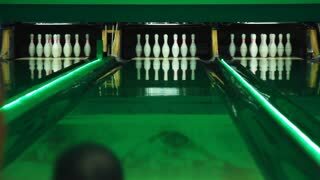 Bowling balls lie on stand close up. Player holds bowling ball with hand. 1940s: Small boy walks on lawn with metal chairs; man plays wooden tetherball bowling game. 1940s: Man plays wooden tetherball bowling game; guests sit in lawn chairs observing, clapping.